I don’t know about you, but I have a huuuuge list of things that I want (or need) to buy for my 5-year old son anyways and it just can’t wait until Christmas…or it becomes pointless then (like Christmas-themed books). So Advent calendar fillers are the perfect way to turn those Christmas-themed items into fun gifts! A lot of these gifts are way too large to fit into an Advent calendar pocket, so what you can do is have a cute basket with these gifts next to your Advent calendar and give each gift a symbol or design that matches one that you put inside their Advent calendar pocket. Or, if you really want to blow your 5-year old’s mind, you can create a little treasure map leading to the gift hidden somewhere (this requires a little more work on your part, but it’s up to you)! Many of these are larger than your average Advent Calendar filler, but like I said, you will probably want to get these anyways, so it’s just a great idea to use up a day on your Advent calendar! This is one of my favorite Advent calendar fillers for 5-year old boys and is thus making its debut on Day 1 in our house! My son is obsessed with pjs. But more importantly, 5-year olds look adorable in pajamas and who doesn’t want those adorable Christmas tree pictures with their kids all matching in their Christmas-themed pajamas? For lots of people, this is a Christmas Eve tradition, but if you like to stretch out the holiday, then these are a perfect early gift to kick off the Christmas season! You can find Christmas pajamas everywhere, but if you want the most adorable ones (or if you need to coordinate with siblings), then I highly recommend you start your search on Etsy. There you can find adorable Christmas pajamas that you can personalize (these are my favorite) or that coordinate boys and girls (we’ll be doing these!). 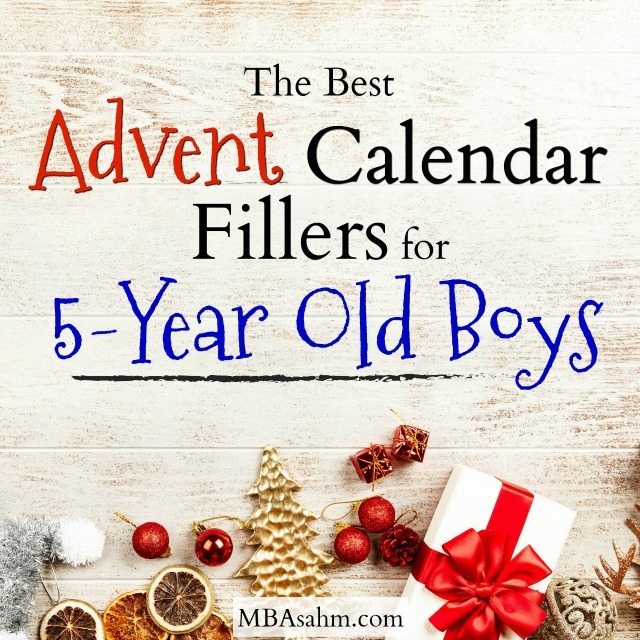 This is another Advent calendar filler for 5-year old boys that should go towards the front of your calendar so you can spend the whole month reading about Christmas! Christmas socks are another really fun Christmas-themed item that you can’t really give on Christmas day, and this one actually could fit into your Advent calendar compartment! These are also a great idea because you can purchase a set of 3 or 4, which will not only fill up multiple days on your calendar, but also ends up being an inexpensive option for those days. If your 5-year old boy can’t get enough LEGOs, then here’s your next Advent calendar filler! The great thing about these Christmas-themed LEGO sets is that once they’ve put them together, they actually make cute little Christmas decorations! Melissa & Doug have a really fun series of Decorate-Your-Own fun (which can be really great for stocking stuffers), but this Christmas ornament set is perfect for an Advent calendar! Not only is this a fun gift for them, but it’s an activity to fill up your afternoon. And they will be so proud to hang their own creation on the tree! Whether your child has their own Christmas tree or not, I’m willing to bet that all 5-year old boys LOVE decorating Christmas trees and having their own ornaments is such a huge treat for them! This is a great time to get fun Christmas ornaments that you know they’ll love – ones that are trains, cars, super heros, dinosaurs, and even Paw Patrol! If you want personalized ones, you should definitely check Etsy’s personalized ornament section because they always have the cutest! 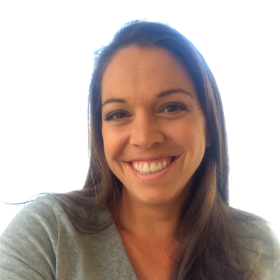 Even after you’ve gotten all the adorable stuff that you can’t wait for your kids to see, you will still inevitably have many days that need to be filled….because 25 is A LOT! 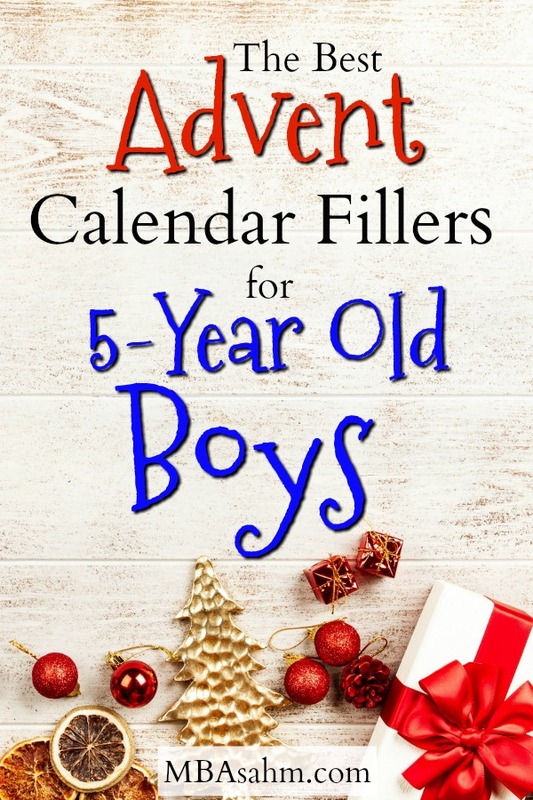 So here are some inexpensive and/or classic Advent calendar fillers that 5-year old boys will really love…and they won’t break the bank. Temporary tattoos are so much fun for little boys and Christmas-themed ones are the perfect way to get them more excited about the season! And, of course, they are the perfect size for any Advent calendar! I love these tiny playdoh tubs and when you buy a pack, they end up being really cheap. If there’s too many in your pack, save them for their stocking or even their Easter basket! My son is OBSESSED with kinder eggs, so these will certainly be showing up! They’re a good size for most Advent calendar compartments and you can usually find them in your grocery store. Oh boy. What good is an Advent calendar for 5-year old boys if it doesn’t include LEGOs?? There are endless options for LEGO sets, but since we’re focused on inexpensive options that are small, you really want to stick to a few sets that are always inexpensive LEGO options (these are also good for stocking stuffers). They still may be too large to fit into an Advent calendar compartment, but they’ll be a fun activity for your child that day! It doesn’t take much to get a 5-year old excited and somehow stickers always seem to do the trick! There are tons of cute Christmas stickers and they’re the perfect size and cost to fit in a few of your Advent calendar days. These are also great to use if your 5-year old is going to be sending out their own Christmas cards! If you don’t want to go the gift route, you can still have so much fun with an Advent calendar! These non-gift Advent calendar ideas are also perfect to mix within a “gift” Advent calendar, not only because they’re fun, but also because many are free. Instead of a present being inside your Advent calendar compartment, you simply add a little note with an activity you will do that day. I hope all of these Advent calendar fillers ideas help make your Christmas extra special this year! There’s nothing better than celebrating Christmas with a 5-year old boy, so I hope the whole experience is one you’ll never forget!